Discover the city that is most famous for their wine, Porto, on a full-day private tour from Lisbon. Once arriving in Porto, head straight to some of the city’s landmarks, such as Porto Sé Cathedral, Torre and Igreja dos Clérigos, and Bolhão Market. Enjoy a delicious Portuguese lunch, included in the tour, and explore some of the famous wine cellars before heading back to Lisbon. Worth seeing and was absolutely beautiful. 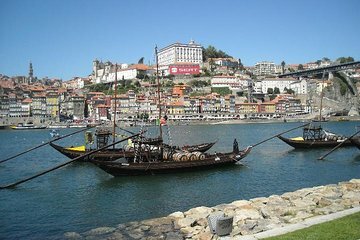 Pass on Port wine tasting and take a boat ride ( promised but not provided). Not well planned and implemented . Amazing views.... long day. It was a beautiful sunny day. We LOVED that our guide took lots of photos of my husband and I. The visit to the wine cellar was fun. Did you know that only wines produced from this region can be called Port, and that there is white Port that is not exported? The lunch at an authentic Portuguese restaurant that is frequented by Portuguese, not tourists, was a treat. The food was good. Besides wine, we were served a beverage that tasted like Tang, as well as bottled water. We thought that was interesting. We visited an old church where we climbed all the way to the top of the steeple and looked out. It was quite a long climb on skinny stone stairs, then you are rewarded with an amazing view of the city and beyond. I think you can see all the way to the ocean, but I'm not sure. We loved our guide.